Every morning, 30 team leaders of the French electricity company EDF met for a briefing. Afterwards, they spread the news to their teams. EDF wanted to make this communication process quicker and more efficient. EDF has found a system for direct communication in Sennheiser’s innova-tion TeamConnect Ceiling which allows participants to listen to the morning briefing via audiolink to obtain all the relevant information live and first-hand. Profile Électricité de France (EDF) is a French electric utility company, largely owned by the French state and headquartered in Paris. On the giant premises of the French energy company EDF, thirty people met in a central building every morning for a briefing about tasks and developments. They then had to swarm out to their respective buildings and spread the news to their teams, a step which meant a loss of time and came with a risk of details getting lost on the way. So EDF’s IT service was given the challenge of finding a more modern and direct way of communicating daily tasks and information to everyone on the vast company site of several acres. After some research, the IT specialists and technicians were pointed to Sennheiser’s latest innovation for decentralized team meetings, TeamConnect Ceiling. Richard Lespiat, representative of the technical supplier RT Events, installed two units of this newly-developed combination of 29 omnidirectional microphones in the meeting room’s ceiling. Thanks to beamforming technology that automatically identifies the main speaker, up to 100 people from different buildings can now join the briefing via a web-based audiolink (LYNC) and listen live. In the big meeting room of 40 square metres, with 30 people attending the meetings in person and 100 more connected, acoustics were a challenge. In order to ease intelligibility, Sennheiser’s SL 52 AW loudspeakers in the four corners of the room were connected to the TeamConnect Ceiling installation. Richard Lespiat was happy: „The resulting auditive support has a very natural sound and is much appreciated because it helps participants understand each other even better.“ But there was a downside: „The acoustic support from the loudspeakers meant that sometimes, crackling paperwork and clicking biros became a nuisance in the headphones of the people listening from outside.“ EDF did, however, find a clever and modern solution to this problem in getting rid of printed agendas and info sheets. Nowadays, only digital notepads and files on laptops and tablets are allowed in the meeting room. 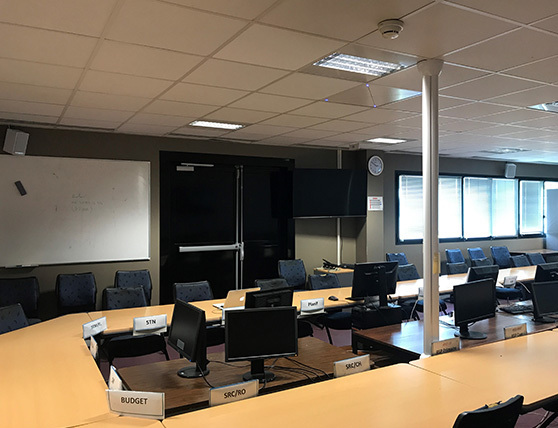 Thanks to TeamConnect Ceiling’s invisible elegance, EDF has now gotten rid of cables blocking the tables and microphones that need charging and regular maintenance. The meeting room is open 24/7, 365 days a year for spontaneous team sessions, so the technicians appreciate that TeamConnect Ceiling’s components are all firmly fixed in the room and cannot be removed. EDF was so taken with the new communication solution that they purchased TeamConnect Ceiling for another meeting room, a room so large it was equipped with even 3 ceiling modules. Two big desks to the sides of the room were each fitted with 3 Speechline gooseneck microphones. The manager’s and his secretary’s desks in the nearby offices have a Speechline microphone with a preferred voice option, which means that when they participate in the meeting from their offices and want to make a contribution, they can do so at any moment during the ongoing conversation. Here again, EDF sometimes invites participants to connect themselves from outside using the LYNC software.